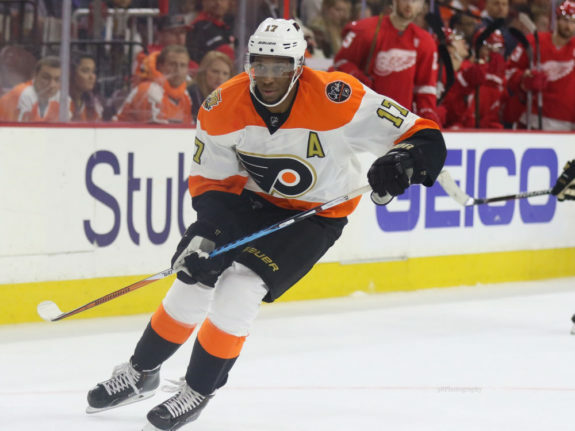 A few weeks ago when the Philadelphia Flyers management and fans found out that star forward Wayne Simmonds was going to be out for a few weeks due to injury, panic began to set in. It’s difficult to lose a top-six forward at any time during the season but when it occurs in the stretch run when your team is pushing for a playoff spot, it escalates it that much more. We’re talking about a six-time 20-plus goal scorer – that’s not easily replaceable. Like any moment of surprise, general manager Ron Hextall had to take a step back to think about the situation. He had to ask himself, “is the streak we’re putting together merely luck or are we the real deal?” “Do we have any options internally that can help fill the void in Simmonds absence?” “Is it worth it to make a trade?” A very tough decision considering that the Flyers have been making their way up the standings. To add fuel to the fire, the trade deadline was just around the corner. Around this time of year, teams that are out of contention are like sharks circling their prey, hoping that a key injury occurs to a competing team so they will overpay for substitute options. It would have been a tough decision for anyone, but Hextall eventually made the correct decision to stand pat and look internally. Finding someone to replace a player of Simmonds’ caliber is no easy task, and quite frankly is nearly impossible. Simmonds is a heart-and-soul player who wears his heart on his sleeve. He will stand in front of the net and take hacks, he will stick up for his teammates, and he makes the game easy for his teammates by taking the goalie’s vision away. In simpler terms, you could never replace the intangibles that he brings to the table. 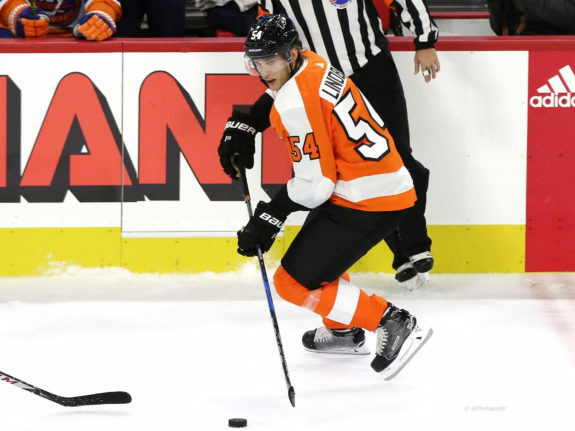 When looking through options from Lehigh Valley, there were a few safe options that have NHL experience, including rookies Danick Martel and Tyrell Goulbourne as well as veteran Colin McDonald. Neither has put up major stats in their short tenures but they’ve been to ‘The Show’ and have held their own. Hextall instead made a more risky but popular decision that fans had been waiting for and called up Oskar Lindblom. Since his arrival in North America, he has looked strong for Lehigh Valley. Fans had been waiting for this call because he is an exciting prospect that has tremendous potential. Fast forward to today and Lindblom is fitting in nicely on the second line with fellow rookie Nolan Patrick and seasoned veteran Jakub Voracek. He doesn’t look out of place at all. Although he hasn’t produced statistically to this point, he has had his chances and has been setting his teammates up with chances. Hextall made the right decision and gave fans a glimpse of the bright future ahead. 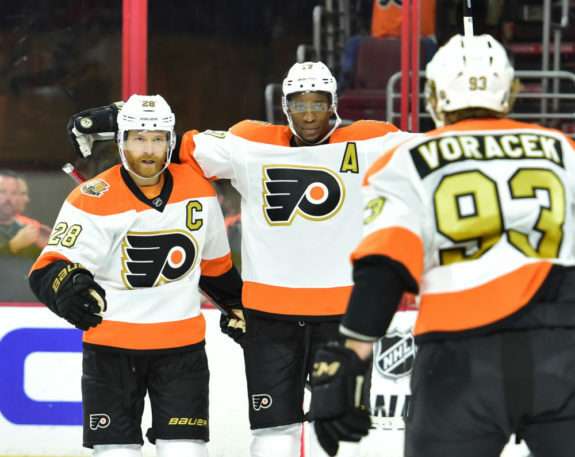 Despite the Flyers’ great month of February – part of which was without Simmonds – they will be happy to have him back in the lineup. Simmonds is an underrated player that isn’t flashy but plays the game hard every single shift. He is a power play guru that has been a contributing part of the Flyers power play success over the years. Patrick has filled in well on the first unit since Simmonds injury but he doesn’t cause anywhere near the havoc in front that Simmonds does. Patrick is more finesse whereas Simmonds is grittier and very good at taking away the goalie’s vision for the point shots from Shayne Gostisbehere and Voracek. While the power play has had its moments in his absence, it will be much better when he returns. Simmonds is also a very defensively responsible forward that gets the puck out and helps out the defenders when he can. He has a knack for getting his stick in the passing lane and eats up minutes on the penalty kill. Power forwards that have the impact that Simmonds has are very scarce in the new NHL. There have been a lot of trade rumours that have followed him around this season, but if the Flyers want to be successful then he needs to remain with the team for the next few years. Fans and management see the value in him, and that will need to continue as he is an irreplaceable leader on a very young team. With a few tough losses to begin March, Simmonds return will be a welcoming sight. Just having him around the locker room and out on the bench when the team needs to hear a voice of confidence will pay dividends. Although Lindblom has slotted in well on the second line, Simmonds’ presence will help that line pick up where they left off prior to his injury. The Flyers are in the stretch run and will need solid play to continue their success. Adding a player like Simmonds to the lineup is helpful at any time, but is important for the Flyers if they want to make the playoffs. It will be interesting to see the immediate impact that he has in tonight’s rivalry game against the Pittsburgh Penguins.